Get skin care advice and special offers. (We'll keep your information confidential). "I'll be posting video blogs regurlary where I will interview current patients, explain the various procedures performed at my practice and discuss pros and cons of new procedures just coming to market." Dr. Rahimi featured on Focus In The Mix. "At 48, Lesley Shapiro is ready to knock a few years off her appearance. Instead of a conventional facelift, she has opted for a procedure that will keep her looking like herself, only fresher. It's a mini facelift called the "tuliplift facelift", patented by Los Angeles cosmetic surgeon Dr. David Rahimi." Forever Young - Get rid of hard to lose fat once and for all. No costly liposuction surgery. No downtime. No Pain. The Quest For Eternal Youth: Westlake Laser Aesthetics & Medical Group Specializes in Keeping Patients Forever Young. Forever Young - Leading the way for safer, more effective and less invasive procedures, anti-aging treatments and long term skin care maintenance. The Quest for Youth "Dr. Rahimi's central philosophy revolves around serving his patients". Articele on Botox, lasers, and Fat transfer. 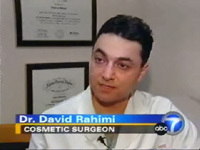 Dr. Rahimi is presented as an expert in the field of cosmetic surgery. We want to help you make good, educated, choices, so please visit our blog for more information. Did you know that the mini Facelift called "Tuliplift" can be performed under local anesthesia? Are your lips too big? Do you want to remove those unwanted fillers? Yes-It can be done. "It was a short office visit, but it made such a difference"
Disclaimer: Results may vary and no guarantees are made. Your doctor will discuss your specific case with you, including risks, options and alternatives.